If you need a little flower for embellishing small projects, this pattern is a good one to consider. The flower works up quickly; it's only three rounds, and it's an easy project. 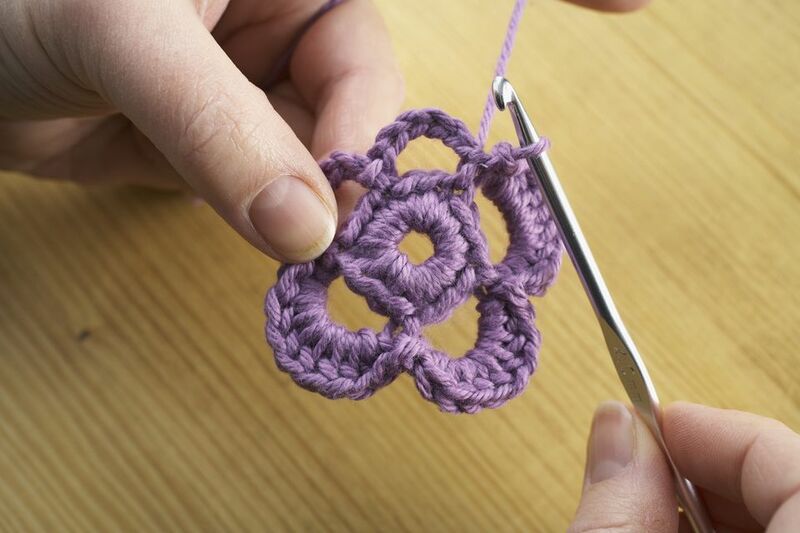 You don't need much yarn to crochet this flower; if you have small amounts of yarn left over from other projects, you can put them to good use with this pattern. The thinner the yarn or thread you use, the smaller your flower will turn out. If you want it to be really tiny, make it in crochet thread and use a small steel crochet hook. If you want it to be a bit larger, make it in yarn and use a crochet hook of appropriate size. If you aren't sure what size hook to use, you can check the yarn label to see if the manufacturer has suggested a hook size; if so, try that size but feel free to choose a different hook if another one would be more comfortable for you. My sample flower measures about 1 3/4 inches and is crocheted with Bernat Softee baby yarn. I used a size H / 5.0 mm hook to make the sample flower. Brackets  denote a set of instructions to be repeated. Ch 4. Join with a sl st to the first ch to form a ring. Round 1: Work 10 sc sts in the ring. Sl st to join the work to the first sc st in the round. Round 2: ch 1; this is the first stitch in your first flower petal. It may seem like an extra stitch, but it's necessary to work this chain so that your first petal will be the same height as the others. [ch 4, skip next sc, sc in next sc.] Repeat the sequence in brackets 4 more times for a total of 5 times / 5 flower petals. Do not join. Round 3: Work 5 sc into each flower petal. Sl st to join the work to the 1st sc st in the round.